Charleston Horse-Drawn Carriage Companies Launch Charleston C.A.R.E.S. — Charleston C.A.R.E.S. Charleston Horse-Drawn Carriage Companies Launch Charleston C.A.R.E.S. New association seeks to establish the gold standard in treatment of carriage horses in the United States. Charleston, SC – Three of Charleston’s horse-drawn carriage companies have formed a new association called “Charleston C.A.R.E.S. (Carriage Association for Responsible Equine Safety)” to promote and advocate for the highest standards of care for horses in Charleston’s horse carriage community. 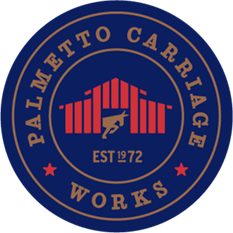 Charleston Carriage Works, Old South Carriage Company, and Palmetto Carriage Works have joined together to form the group and plan to work together to give the community a closer look at the superior treatment of carriage horses in Charleston. Each member company in Charleston C.A.R.E.S. has agreed to a set of strict standards that exceed the federal, state and local animal protection laws to ensure the safety and well-being of the horses. Charleston C.A.R.E.S. launched a website as well as Facebook, Twitter, and Instagram pages to promote both the industry and the treatment of the carriage horses.